Catalysts for Social Action (CSA), established in 2002, works as a bridge between institutionalized children and prospective adoptive parents. The NGO also seeks to build the capacity of adoption agencies, enabling them to not only function more efficiently, but also provide the best possible rehabilitation to the children in their care. CSA currently partners with 48 adoption agencies in Maharashtra, Madhya Pradesh, Goa and Orissa. CSA has been able to directly facilitate the adoption of 171 children from its inception till date, and its outreach further extends to thousands of more children indirectly, through support to its partner agencies. In FY13, CSA underwent management restructuring, as a result of which the ability of the organization to fundraise was temporarily affected (an approximate 12% drop in income with a marginal FY13 deficit was recorded). The current management is now focusing on developing an efficient fundraising strategy for the organization, which is already showing good results halfway into FY14. CSA primarily relies on donations from individuals (ref: Fig. 1), especially through fundraising events and online portals. 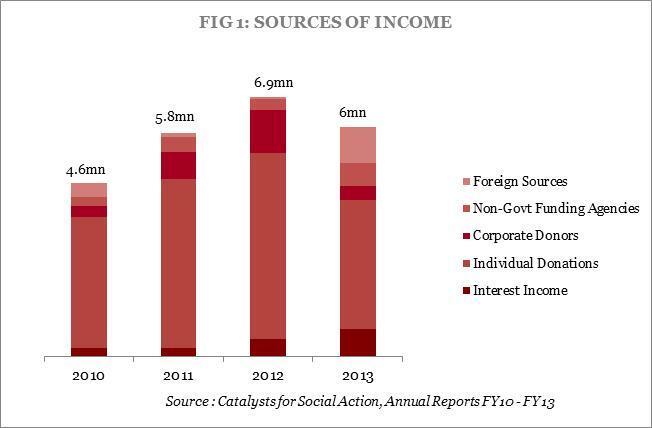 In FY13, income from foreign sources has made a notable increase from a mere 2% in FY11 and FY12, to 16% of total income in FY13 (ref: Fig. 1), owing to improved publicity on platforms such as the Global Giving website. CSA is also focusing on increasing its corpus fund base, and has entered into committed partnerships with corporate organizations for regular donation to the corpus fund. Direct Program Expense vs. 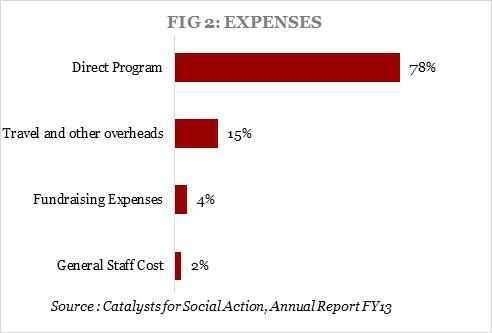 Expenditure on Overheads: 78% of CSA’s expenditure can be attributed directly to program related activities (ref: Fig. 2). CSA has steadily been increasing its spend on programs (It was just 57.5% in FY10, for example). Travel Expenses increased from Rs0.4mn in FY12 to Rs0.7mn in FY13 owing to the increase in the number of centers across 4 states. Fundraising has become more efficient – CSA spent 4.2% of its expenses on this account in FY13 (ref: Fig. 2) as compared to the usual range of 10-13% in the previous three years. Income Growth Rate (IGR): The IGR, which measures the increase in income year-on-year, has been decreasing over the past 3 years. CSA, however, always had sizeable surpluses to carry forward, until FY13, when there was a deficit. With a reconstructed management and a fundraising strategy introduced, CSA hopes to improve the IGR in the current year and beyond. Self Sufficiency Ratio (SSR): The SSR measures the NGO’s ability to cover operational expenses from income sources other than organizational donors (who support only in the short-medium term), such as individual donors, sales, investment income, etc. CSA’s performance in this area has been declining, which can be attributed to a recent decrease in individual donations, and an increase in funding from foreign sources and non-governmental organizations. CSA is now strategizing on ways to increase the individual donor database, especially through events and engagement of former donors. Increase in interest income is also likely in the coming years due to the continuous increase of corpus funds. Corpus to General Fund Ratio: The quantum of corpus funds has significantly increased in FY13 (up 67% from FY12). General funds have increased by 6% from FY12. Sourcing the right parents for adoption, i.e. those without preferences and prejudices. Older children remaining in the system, with reducing chances of being adopted. Government process for approving adoptions being long and arduous. Logistical constraints faced by partner agencies, which slows down the process of matching parents with children. The Board of CSA comprises a number of accomplished leaders from the corporate and social development worlds. The founder Members, Vipul Jain (MD of Kale Consultants) and his wife Shibani, were motivated to form CSA after the experience of adopting their daughter. Brajesh Misra, Director at the Indian School Finance Company, also serves as a Board member and is an adoptive parent as well. The Board also includes Meher Gandevia-Billimoria, former Head of Education at Akanksha. CSA has been listed by several national and international nodal agencies, including the Credibility Alliance, Give India and Global Giving.